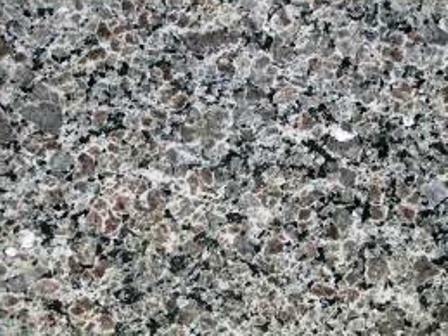 Our color spotlight of the day is… New Caledonia granite! This beautiful granite color is quarried in Brazil. The stone is made up of medium to dark gray color tones with black and beige veins throughout. This granite is widely used not only for kitchen and bathroom countertops, but for large commercial projects as well. New Caledonia granite is characterized by a medium-sized, consistent pattern that gives it an overall uniform look. Its unique grain structure is very consistent between the different slabs. Since gray is the latest “hot” color choice for kitchens and it is also a neutral color as well, it is extremely popular and sought after for kitchen designs. New Caledonia pairs well with white, black, light gray, or even dark brown cabinets. If you have a kitchen area with a lot of natural light, the color shades in this granite may appear much lighter, while in rooms with limited natural light, the countertops may appear much darker. The varying splashes of beige and brown give the granite slab an interesting look, while the gray, white, and silver speckles add a surprising and spectacular effect. Using stainless steel appliances, along with silver hardware in the kitchen will bring out the sprinkles of silver that are actually found in the granite. With the beauty it possesses, New Caledonia granite will be a perfect addition for your kitchen, bathroom or any part of your home. This will totally give your kitchen a new and unique appearance. Looking at it from a distance will give an interesting look because of its combination of colors. Not only is it elegant, but it has but also a quality that will outshine its physical appearance. New Caledonia granite is heat resistant, stain resistant and scratch resistant. Beauty and brawn combined for the perfect countertop! Find great deals on new shipments of New Caledonia granite. Stop by our showroom today or give us a call to Reserve a Slab!